Now, I've discovered my own version of that technology and I'm using it for militaristic purposes. I've even started to use the technology myself, which as a sort of psychotic effect on people if they use it too much. I can't get into the details of all the goodies of the Yellowjacket suit but it's several generations advanced from what Ant-Man has. 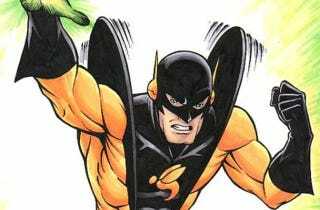 And then I put it on—and then I am Yellowjacket! Looks like Cross is going to have quite a backstory behind his villainy.